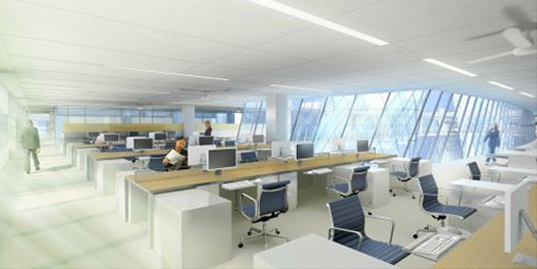 The winner of Metropolis Magazine’s competition to redesign a 60s era Federal government office in downtown Los Angeles was just announced, and the proposal is a radical shift in thinking about green retrofits. 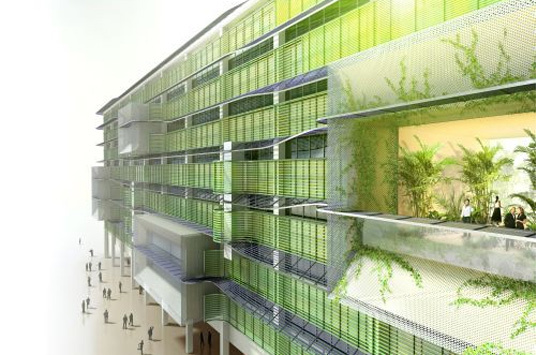 The conceptual launching point of the project, called Process Zero: Retrofit Resolution , incorporates an algae farm and bioreactor onto the sunny southern side of the building to provide energy and clean both wastewater and air at the same time. Inspired by that fresh approach, the team’s proposal is a thorough re-visioning of making the building fully integrated with the city, the environment and workers. The competition, now in its 8th year, is for emerging architects and designers to push the limits on design, and this time focused on helping the Government Service Administration re-imagine how it can make their massive number of aging buildings environmentally sound and better places to work in. The winning team, made up primarily of professionals with 10 years or less of experience from HOK and Vanderweil, used the premise of the Living Building Challenge 2.0 to design a building that was not just a better place to work and made all of its energy on site, but also cleaned the air and water around it. That goal was achieved by the unique proposal of incorporating huge glass tubes on the southern façade of the building which will hold algae breeders. The technology is being heavily researched by many private and public groups with the hope that the right technology and algae species can create useable fuel. The technology uses waste water from the building as nutrients and pumps CO2 laden air from the freeway to the basic building block for the plant. The algae then pumps out oxygen and creates fatty lipids which can be burned in co-generators for heat and electricity. The team pushed the design further by slicing open the vast roof and building a series of carefully placed light shafts. The design will provide daylight for 100% of the interior, a far cry from the cave-like working conditions in the building now. The energy savings start to really add up when artificial lighting is minimized but to get to net zero the team proposes to eliminate all desktop computers and use efficient cloud servers for data management. Of course, a solar array on the roof and a deep energy retrofit is also in the cards including shading, natural cooling and efficient user controlled heating. Many proposals for net zero energy buildings exist now but few retrofits go so far, especially retrofits that improve the environment rather than just degrading it at a slower pace. The competition, now in its 8th year, is for emerging architects and designer to push the limit on design, this time to help the Government Service Administration re-imagine how they can make their massive number of aging buildings environmentally sound and a better place to work in. The winning team, made up primarily of professionals with 10 years or less experience from HOK and Vanderweil, used the premise of the Living Building Challenge 2.0 to design a building that was not just a better place to work and made all of it energy onsite but a building that cleaned the air and water around it. 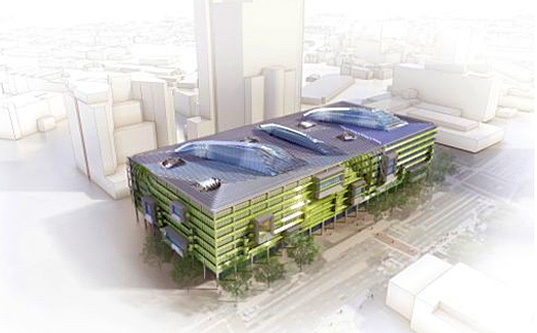 That goal is achieved by the unique proposal of incorporating huge glass tube on the southern façade of the building which will hold algae breeders. The technology is being heavily researched by many private and public groups in the hope that the right technology and algae species can create useable fuel. The technology uses waste water from the building as nutrients and pumps CO2 laden air from the freeway to for the basic building block for the plant. The algae then pumps out oxygen and create fatty lipids which can be burned in co-generators for heat and electricity. The team pushed the design further by slicing open the vast roof and building a serise of carefully placed light shafts. The design will provide daylight for 100% of the interior, a far cry from the vast cave-like working conditions in the building now. The energy saving starts to really add up when artificial lighting is minimized but to get to net zero the team proposes to eliminate all desktop computers and use efficient cloud servers for data management. Of course a solar array on the roof and a deep energy retrofit is also in the cards including shading, natural cooling and efficient user controlled heating. Many proposals for net zero energy buildings exits now but few retrofits go so far, especially retrofits that improve the environment rather than just degrading it at a slower pace.